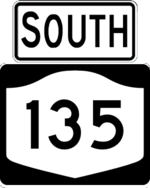 NY 135 is the Seaford-Oyster Bay Expressway, crossing Nassau County. The expressway was never completed, with stubs at both ends. At its southern end, it was planned to connect to the Ocean Parkway via the Wantagh Parkway. At its northern end, it was originally planned to connect to NY 106 in Oyster Bay, and later to a cross-sound bridge to Rye that would be an extension of I-287. The bridge proposal is occassionally revived to this day.